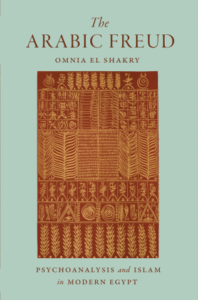 Omnia El Shakry’s The Arabic Freud is both admirably ambitious in its quest to map “the topography of modern selfhood” and meticulous in the stories it threads together in this process. What the book offers across its four chapters is not only a description of a moment in intellectual history—the emergence of psychoanalysis in twentieth-century Egypt—but an entire method of history writing, navigating the conceptual poetics of reception and translation, on the one hand, and pushing critically at the valences of ethics and politics, on the other. The book begins with allusions to Sigmund Freud, Yusuf Murad, Muhammad Fathi Bey, and Moustapha Safouan, and ends with a question about the possibilities of radical critique in an ethical encounter with the Other. Part one includes reflections on the soul and the unconscious, with chapters on the work of Yusuf Murad and the theological backdrop in al-Taftazani; and part two considers spaces of interiority in the domain of sexuality and then law. The critical importance of the questions raised and the imaginative scope of the book assure its place alongside key philosophical reflections on selfhood. And yet, The Arabic Freud’s unique strength derives from what many of these other philosophically oriented studies fail to offer. In contrast to the abstraction often characteristic of the genre, El Shakry masterfully situates her reflections in time and place, attending to how selfhood comes to be understood in the entwined traditions of psychoanalysis and Islam. The book is instructive both in the story it tells and the method it reveals in doing so. On one level, I found the book methodologically illuminating as a work of intellectual history. With sources drawn from Majallat ‘Ilm al-Nafs as well as a range of archival material in Arabic, French, German, and English, the book can be read as a historical account of the formation of a field of psychoanalysis in twentieth-century Egypt. On this front, El Shakry is critically attentive to “an interdiscursive web” in postwar Egypt, including links between the fields of psychology, law, and literature. She connects figures such as Tawfik al-Hakim and Youssef Chahine seamlessly alongside psychologists, theologians, and criminologists. But her work is hardly limited to a strict historical contextualization. Instead, she also notes that the “new science of the self drew both from Freudianism and other psychoanalytic traditions, as well as from key classical Islamic thinkers . . .”, and she pushes toward a model of contemporaneity that embeds Islamic thought in the story she tells. “The hybridization of psychoanalytic thought with pre-psychoanalytic Islamic discursive formations,” she tells us in the opening pages, “illustrates that The Arabic Freud emerged not as something developed in Europe only to be diffused at its point of application elsewhere, but rather as something elaborated, like psychoanalysis itself, access the space of human difference.” She thus gestures to the contemporaneity of discursive traditions in such a way that a figure like Ibn ‘Arabi speaks as directly to psychoanalysis as does Yusuf Murad or Moustapha Safaoun. On another level, I also admire the implicit challenge each chapter poses to a secular historical account. With attention to various registers animated by psychoanalysis, the book articulates the implicit connections linking the modern self to the religious traditions through which selfhood is imagined. In a critical gesture, the various chapters refuse distinctions between secular and non-secular modes of thought, and position Sufism as integral to the reception of psychoanalysis. Pointing to a sort of ethical entanglement, El Shakry notes that, in the middle of the twentieth century, “psychoanalysis had not yet been reduced to a political and ideological signifier emptied of all meaning, a mere weapon in a Manichaean struggle between secularism and civilization on the one hand and nonsecular forms of reason and ethics on the other.” As a model of intellectual history, El Shakry sheds light on a method of history writing that both accounts for the emergence of a set of questions and for the various discursive traditions brought to bear in response. The resulting constellation both recognizes and intertwines distinct disciplinary formations, but it does so in a manner that elucidates selfhood richly, critically, and imaginatively. Not simply a philosophical, religious, or scientific conundrum, selfhood emerges in a constellation of all three, making this story of Egypt in the twentieth century almost paradigmatic of selfhood in colonial and postcolonial societies. Beyond these richly historical and theological dimensions, I found myself especially drawn to the framework the book offers for a sort of critical translational practice—both on a linguistic and a more broadly cultural level. There is a distinct engagement with how certain psychoanalytic terms and concepts are rendered in Arabic. In the opening chapter, for example, El Shakry suggests that Salama Musa initially translated the term “unconscious” into Arabic in 1928, but that it was Yusuf Murad’s term that eventually stuck: “Notably,” we are told, “Murad observed that he often returned to classical Arabic texts in order to create new translations for words and clear, precise, and capacious meanings.” What is especially brilliant is that translation pertains both to Murad’s adapting French or German words in Arabic and, more fundamentally, to the institutions and disciplines he helps to forge. That is to say, translation in El Shakry’s book is not only a matter of rendering one word in another language, but is contingent upon an entire framework through which these terms are made intelligible at a certain moment in time. The sort of robust historical account she traces is inseparable from how certain psychoanalytic concepts come to matter amidst a set of institutional practices and nascent disciplines. In the story of Murad and his circle of interlocutors, we shuttle between psychology, philosophy, and classical Arabic thought, and we encounter literary, scientific, and political figures integral to forging the sciences of selfhood. This situated method sheds light on traditions of reception, translation, and conceptual rebirth, and also models a type of inquiry as relevant to history as it is to philosophy, literature, and culture. I marveled at the sorts of imaginative connections the book renders visible, and I learned richly from the implications of the ricochet between Europe and the Middle East, social science in twentieth-century Egypt and classical Arabic thought, psychoanalysis and Sufism. Indeed, the story told is not simply a matter of exporting Freud to Egypt so much as negotiating the reception of his work in a deeply contextualized understanding of sciences of the self in twentieth-century Egypt. And yet, a key aspect of postcolonial analysis is its tracing of vectors of translation, not only from source to adaptation, but from adaptation back to source. In this context, one might ask about the implications that the Arabic Freud had on the German Freud. Apart from the reference to Ibn ‘Arabi in Jacques Lacan, I wonder whether the potential vector of translation (from adaptation back to source) is at all consequential to the story told about psychoanalysis in Egypt. Part of the richness of the book is how it intertwines so many fields of knowledge, but such an argument necessarily situates the German Freud and Sufism as seeming supplements to a most insightfully described central axis. This point is less a criticism than an observation of the shifted terrain of analysis—away from the poetics of source and adaptation, margin and center, and toward the site of reception and rebirth. Fidelity and adaptation seem less an issue than the descriptive labor of reception within the competing fields so insightfully drawn together. That The Arabic Freud is not mired in a question of translational directionality is itself part of its richness. The dynamics of the Arabic reception refreshingly avoid the narcissism implicit in the conventional framework of sources and adaptations. It might seem, then, that the very question about vectors of translation overlooks the imaginative pathway this book offers. No longer a matter of an original Freud exported outward, the story told here derives from the birth of Freud in Arabic—with all of the social, political, and religious resonance of his work. The latter two chapters, which point to sexuality and criminality as fields in which psychoanalysis comes to play an important role, struck me as especially compelling for the implications they provide queer theory and legal studies. The case of psychoanalysis in Egypt emerges as the framework for a story that functions as “a hybridization of Freudian thought and theory with classical Islamic ethics.” Out of this encounter emerges a mode of reading sexuality and law that positions Egypt less as radically exceptional than as a site and occasion for understanding the poetics of reception. In the end, The Arabic Freud is not only a pioneering work of intellectual history, but a method of critical translation entangling various traditions across time and space. If there is a translational vector to be traced, it might well not be a relation between source and adaptation at all. In fact, I see in this book a translational vector toward the future—something affirmed eloquently in the closing pages and performed in the conceptual poetics of each chapter. With its rich commitment to situated analysis and its engagement with the resonance of texts in dialogue with past and present, The Arabic Freud furnishes a model and a method worthy of emulation by future scholars exploring the critical afterlife of theoretical concepts. Michael Allan is associate professor of comparative literature and Petrone Faculty Scholar at the University of Oregon, as well as a EUME Fellow of the Alexander von Humboldt Foundation (2017-2018). He is the author of In the Shadow of World Literature: Sites of Reading in Colonial Egypt (Princeton 2016, Winner MLA Prize for a First Book), and is currently researching the travels of the Lumière Brothers film company across North Africa and the Middle East.